It's time to say goodbye to the holidays and to the year 2014 and move on to greet the new year ahead. I can't believe another year has passed and so quickly. My dad used to tell me when I was just a kid complaining about how slow time passed that when I got older time would seem to fly by. He was right! Whiz.....another year gone. I spent some time last Saturday at a huge antique market place in Scottsdale where I ran across this dress for sale. The bright orange color stood out from everything else in this booth. 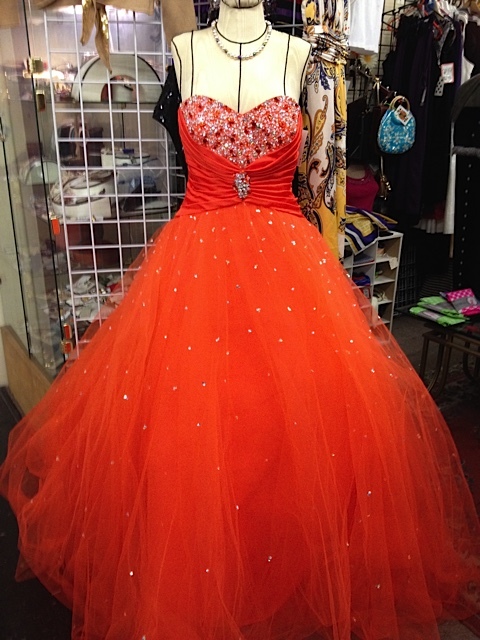 I can't imagine wearing a gown this bright to any event. But, I have to admit that my very first formal gown did have a big flouncy, net skirt like this one. It was just a much more subtle pastel color. 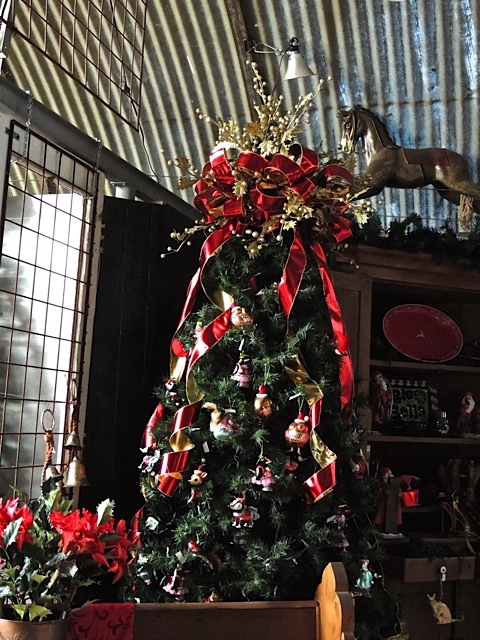 I stopped at a local nursery Sunday afternoon to look for some plants for my balcony patio and I found myself in the "Land of Christmas" and half-priced Christmas at that. Everything was 50% off. 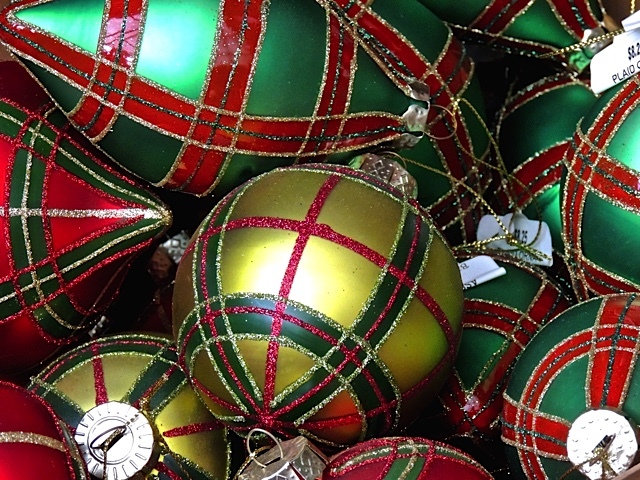 I managed to leave without any of these gorgeous decorations but, I did admire that very large and very elaborate tree-top bow in the photo to the left. 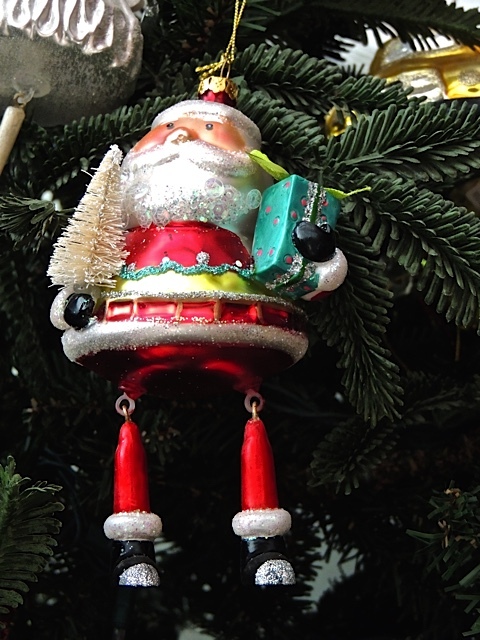 I think I might have mentioned last year that I collect Santa Claus ornaments. I usually get a new one every year but, I didn't buy one this year because I didn't put up a tree. This fellow caught my eye and I really admired him. What do you think? Should I go back and get him for next year's tree? He is 50% off! When I took that walk through the Biltmore Estates, this was my favorite house. It really looks like it belongs in Tuscany or maybe the French countryside. 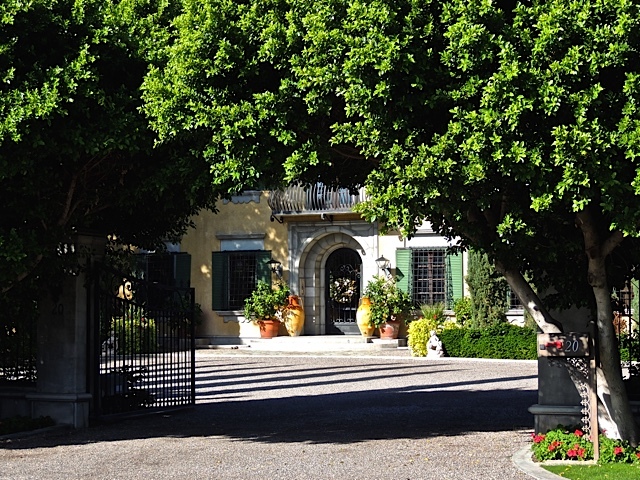 I dared to step under those trees that frame the entrance so I could get a closer look at the house itself. I love it! I have a new post on Sharon's Sojourns today. 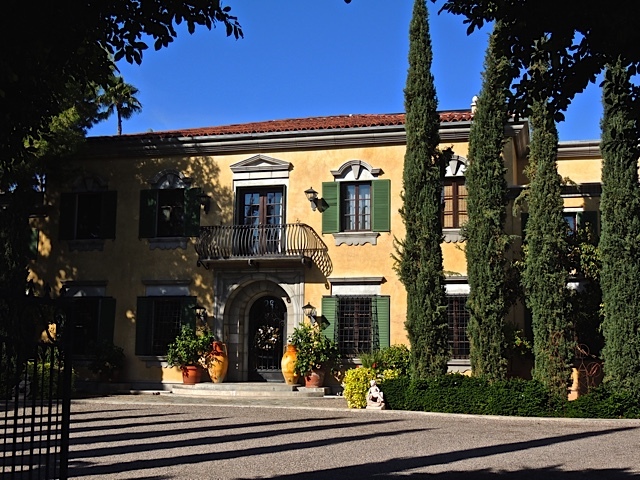 This time I visit the little known southern California wine region. Holiday decorations in the "hood"
I took a long walk in my new neighborhood a few days ago and took some photos along the way. My new place is on the Arizona Biltmore property and sits right on the edge of the Biltmore Estates so I have some pretty "fancy" neighbors. 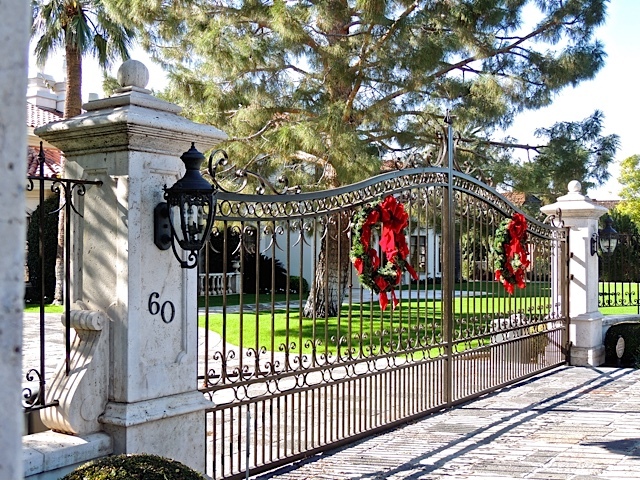 Now I can admire all these grand homes while I get my walking exercise. 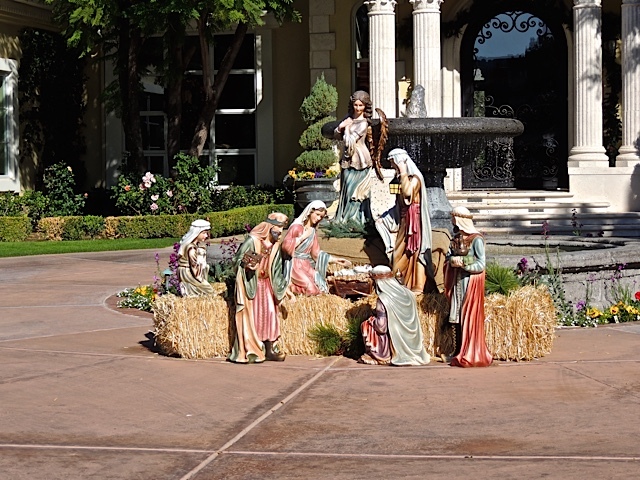 One of the houses had this extra large nativity set (above) sitting in the center of their circle driveway. 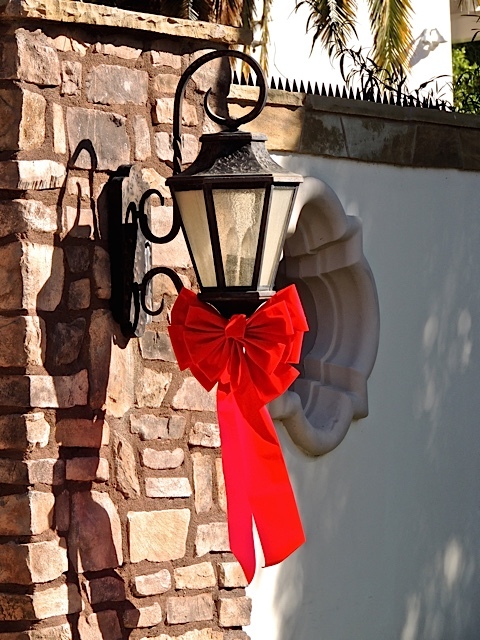 This house had a solid gate so the only decorations I saw were these red bows on the lamps. I hope everyone had a lovely holiday. 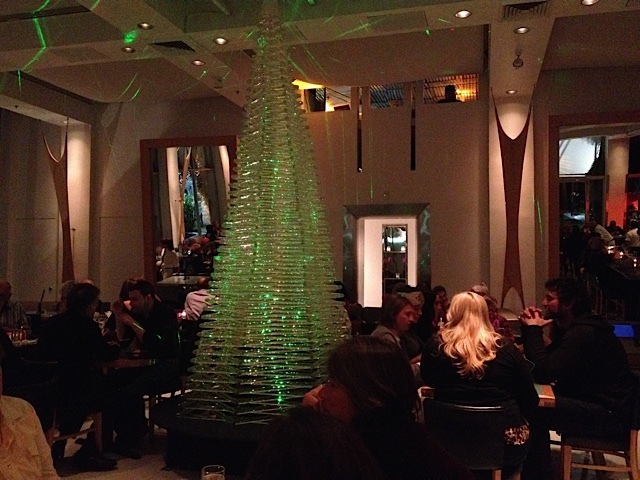 I enjoyed a wonderful Christmas Eve party with close friends. Yesterday David and I went to see the new movie "Into the Woods" and loved it. It was very well done. Then we met David's brother James and friend for dinner. It was a truly enjoyable Christmas! I hope you all are having a splendid holiday with family and friends and enjoying good food to go with the good company! Happy Birthday to my sister Judy of Prescott Area Daily Photo! Have a wonderful day! Santa is off and flying, making his rounds around the world. 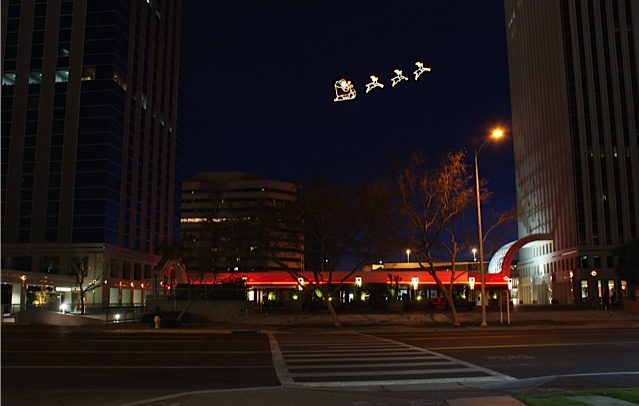 This flying Santa has been soaring between these two high-rise buildings in central Phoenix for well over 40 years. It's always nice to see him light up the sky. 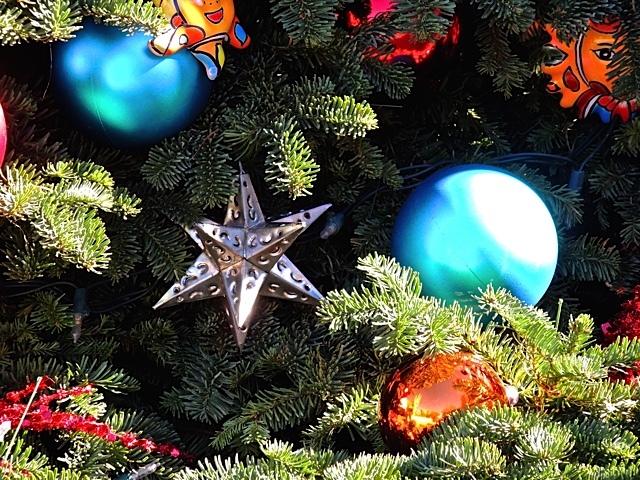 Have a very happy holiday everyone! Yesterday I had photos of the Christmas tree in front of Webster Auditorium, today I've walked around to the back of the auditorium in the cozy courtyard that resembles the courtyard of a southwestern home. 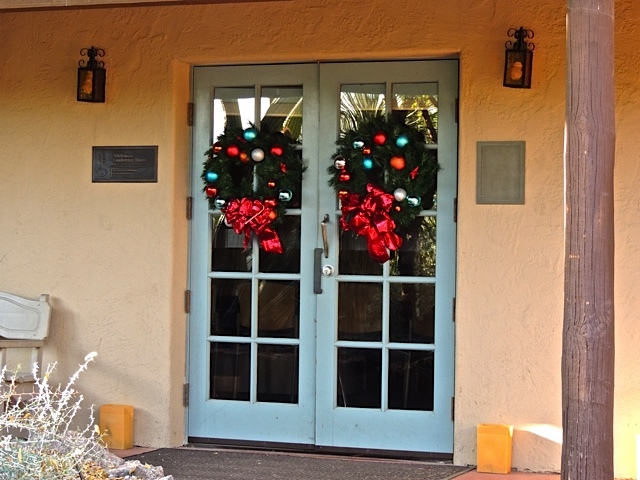 The doors are decked out with wreaths. 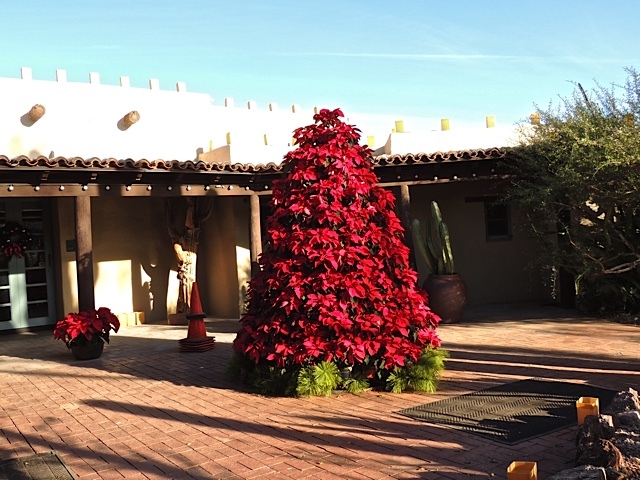 There is a poinsettia tree in the center of the courtyard. You can see that the roof is lined with luminaries. Those are lit every night for the gardens famous Las Noches de Las Luminarias. 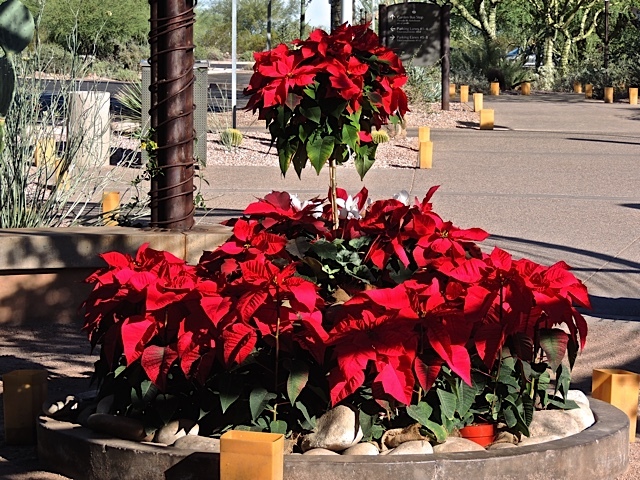 At the entrance to the garden, the little fountain has been converted to a wonderful display of bright red poinsettias as the luminaries lead the way from the parking into the garden. 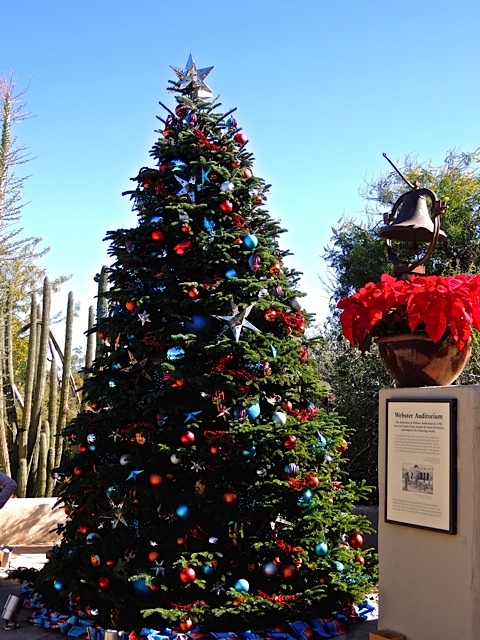 As always, the Desert Botanical Garden is decked out for the holidays. This tree stands in front of Webster Auditorium where they place a tall tree every year. 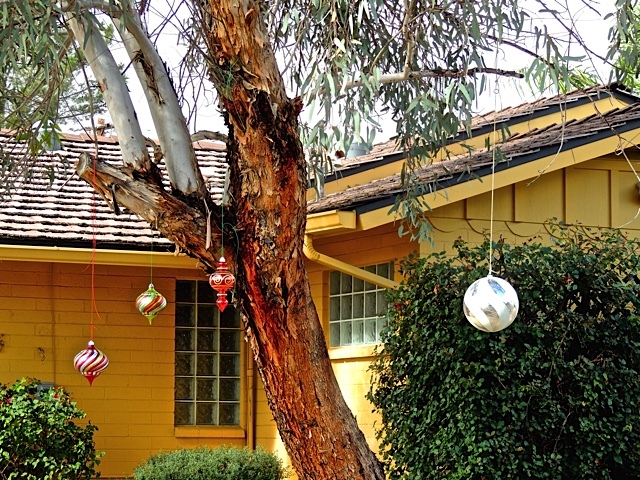 I love that they add some southwestern ceramic and some Mexican tin ornaments along with the colored glass balls. Happy Birthday to my sister Pam in chilly Missouri. I hope you are having a day full of celebrating. 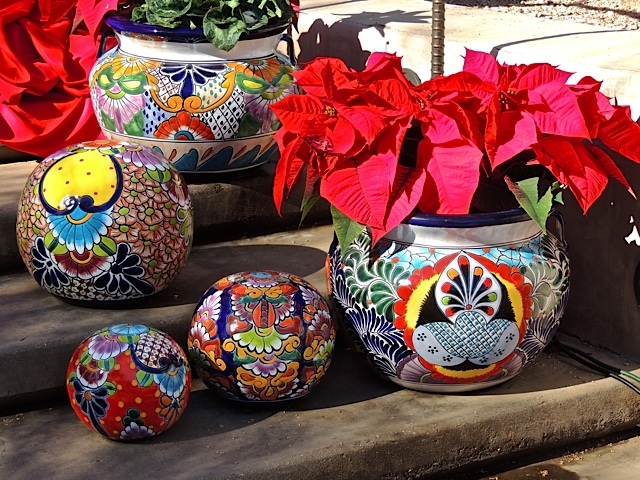 Poinsettias, with a southwestern twist. I have a new post on Sharon's Sojourns today. I'm exploring the inside of the Egyptian Museum that I featured last Sunday. 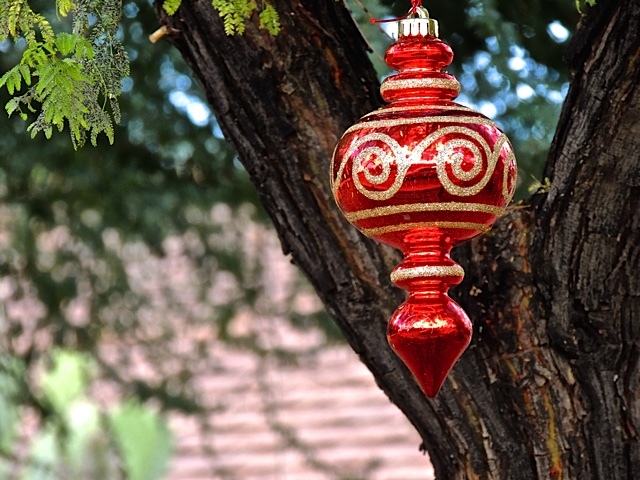 I love these oversized ornaments I saw hanging in a yard near my house. 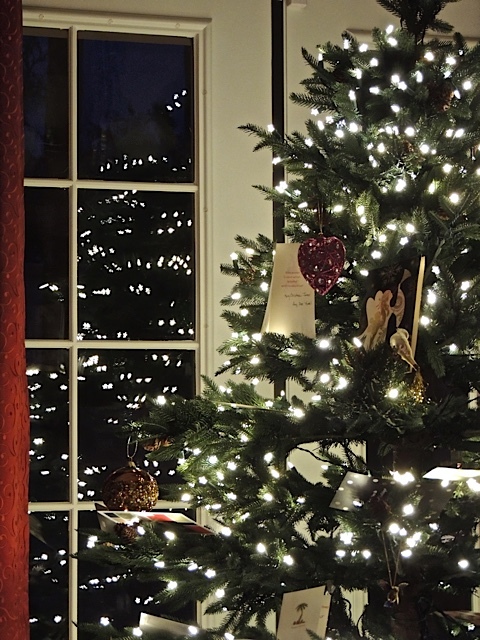 They convey the Holiday spirit without all the flickering lights. They were scattered all around the yard of this home. A gentle reminder that it's that time of year when we celebrate friends and family. 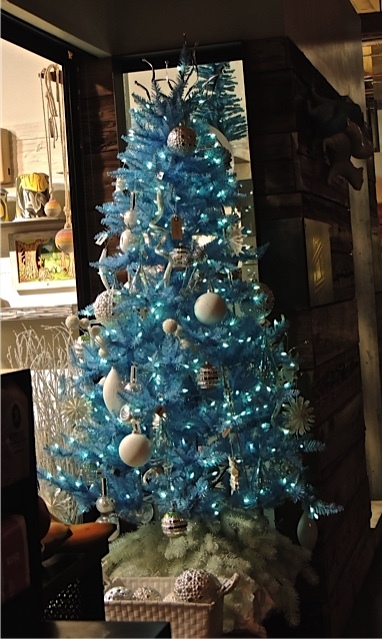 Someone is having a blue Christmas and it's not Elvis Presley. I saw this tree decorating a shop at the Biltmore Fashion Park. It's kind of pretty in a "blue" sort of way but, I think I stick with the traditional green....for now. 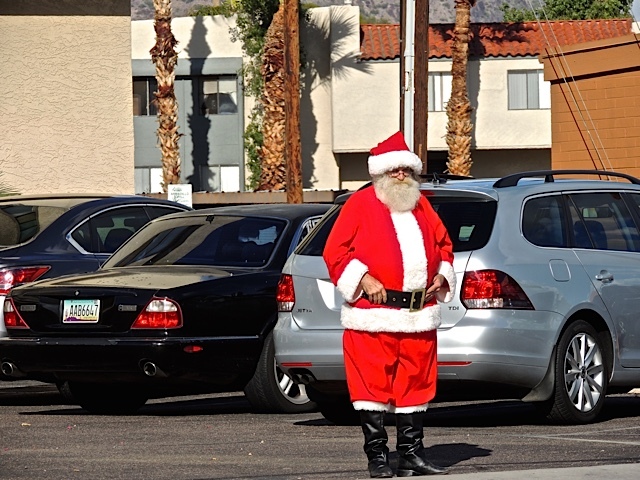 I was stopped at a traffic light when I looked over and saw Santa standing there watching the traffic and occasionally waving to people passing by. I'm not sure what he was up to but, this time of year, the man seems to be everywhere. 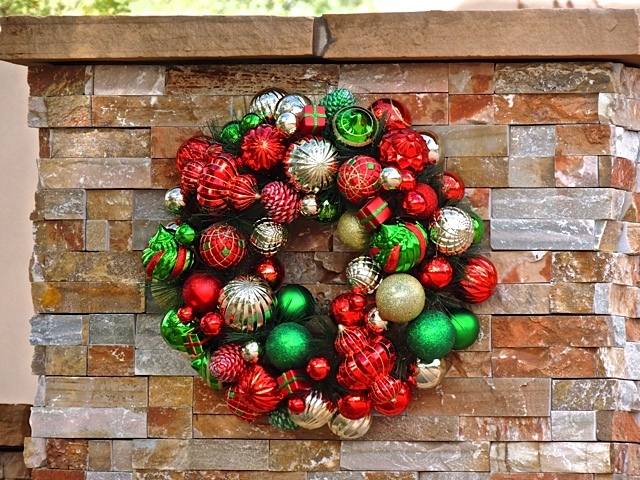 I love this colorful wreath of ornaments I found on a fence post. It has such a festive feel to it. 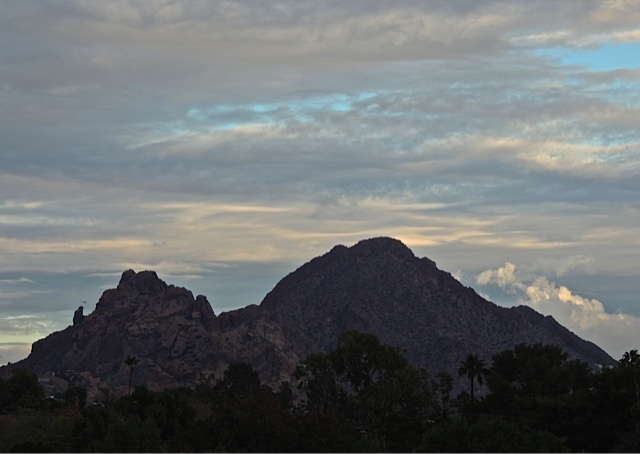 Last Saturday, stormy skies rolled into the valley bringing some much needed rain and spectacular skies. I took a drive to find places to get good shots with those fabulous and quickly moving clouds. 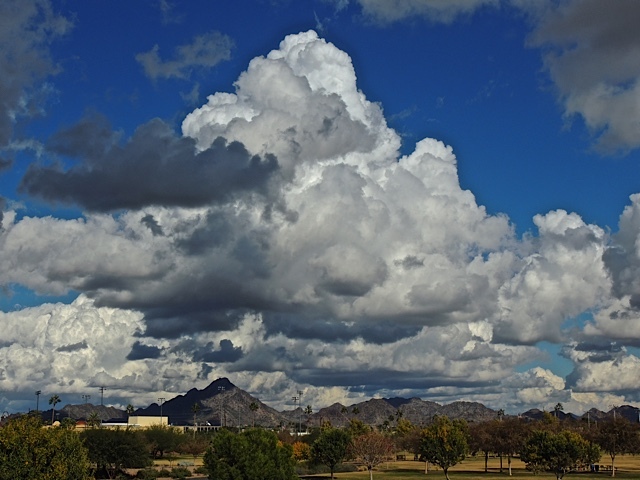 The one above was taken at Steele Indian School Park looking north east. 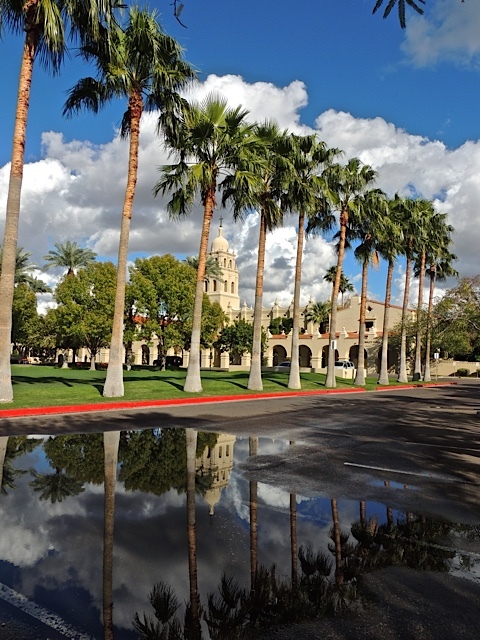 The photo to the left was taken at Brophy Preparatory School. I liked the way the chapel tower was reflected in the puddle. This last one I took from my place. I don't think I'll ever get enough of that view. 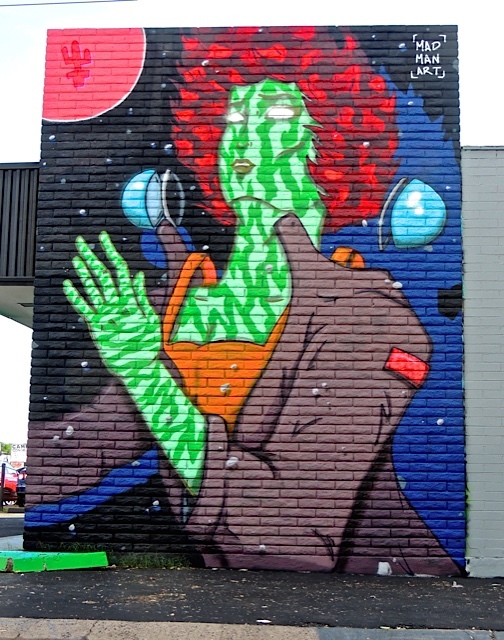 I found this mural on the side of a shop called Just Blaze, a tattoo and smoke shop. The Mural is clearly labeled "Mad Man Art" which appears to be the signature name for artist John Moody a muralist from Phoenix and LA. It appears he goes by two names; Mad Man Art and MDMN. It's a not-so-little green man (or woman, I can't tell). 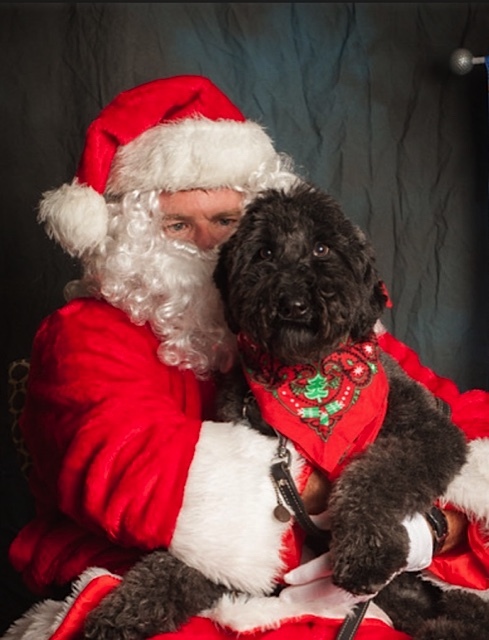 A friend of mine texted me this adorable photo of her dog "Effie" posing with Santa. Effie looks like she knows exactly what to do but, I think Santa might be a tiny bit skeptical. I have a new post on Sharon's Sojourns today. I have photos from my recent trip to San Jose to visit the Egyptian Museum. 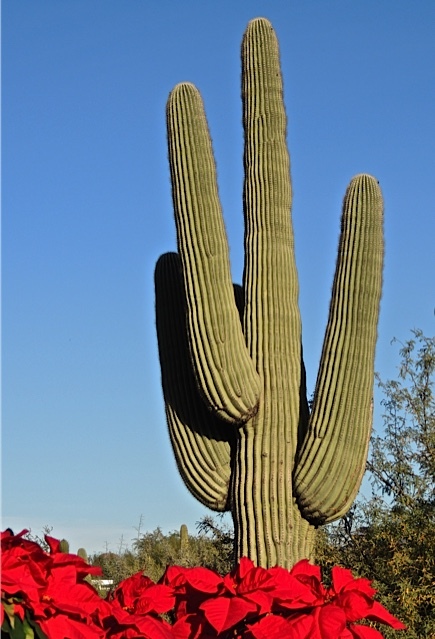 Some bright red poinsettias in front of a tall saguaro cactus. 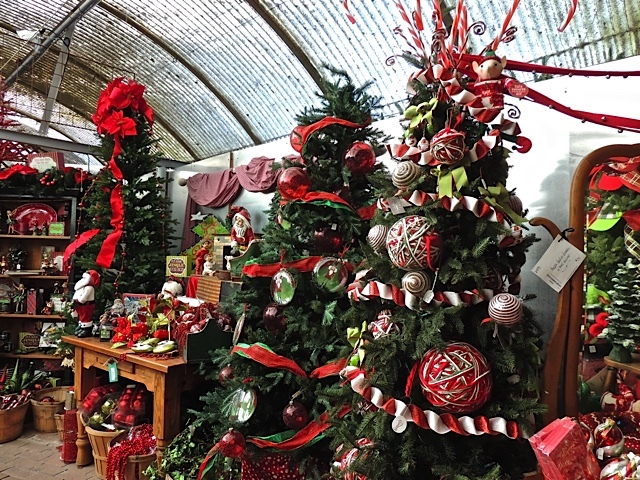 I went to the Desert Botanical Garden Friday morning for a walk and found the place all decked out for the holidays. There was something fun to see in every direction. I stopped at Scottsdale Fashion Square last evening and found something new this year. 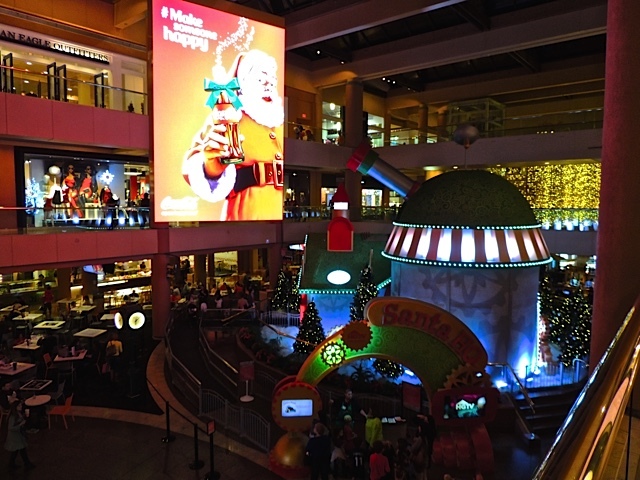 They put a giant Santa-land in the center of the food court and I saw parents lining up to take their kids inside. Oh and, that giant advertising billboard hanging from the ceiling is also new. 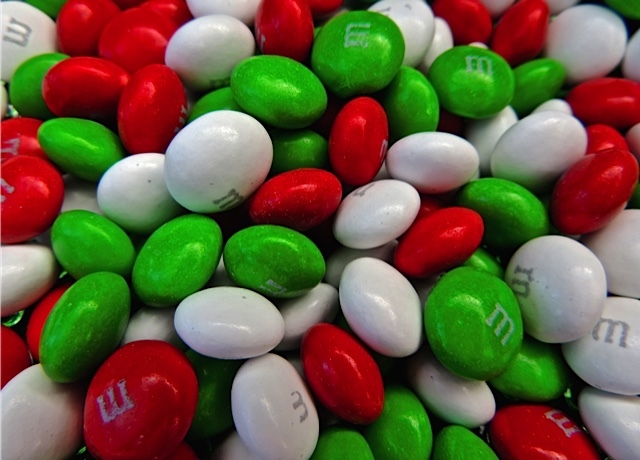 You know the holidays are upon us when the M&M mint flavored candies are in all the stores. I love M&M mint candies. So when the holiday treats show up in the stores, you can bet some of these will end up in my candy dish. Grab a handful....I can't eat them all myself! 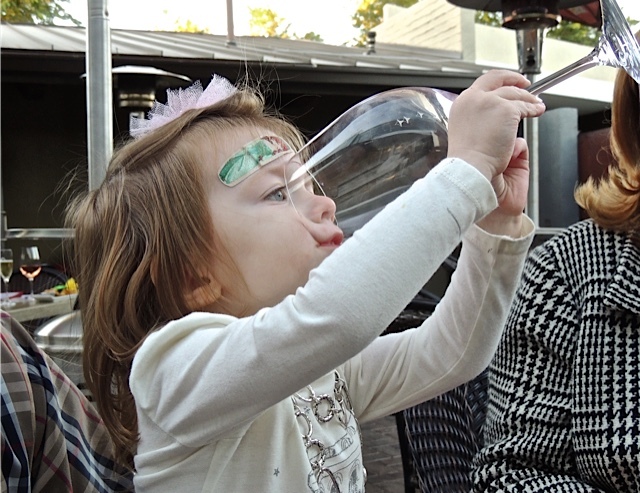 Youngsters with Italian roots learn wine appreciation at an early age! She was just drinking water out of a wine glass but, I thought it was a cute shot! Saturday night I attended another "Pink Martini" concert at the Scottsdale Center for the Arts along with my good friend David, Julie and Dave, and Julie's mother Glenda. David and I had dinner first at AZ 88 a restaurant I've featured here before. It's the place that always has ever changing eclectic decor. 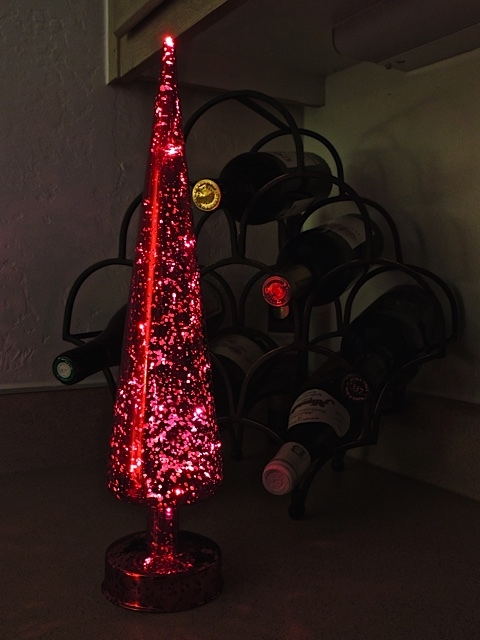 This years Christmas tree at AZ 88 is made of glass with colored lights inside and as they twinkle it creates light patterns all over the walls and ceiling. You can see some of them in this iPhone shot. Pink Martini put on a fabulous show with (for the first time) both female singers, China Forbes and Storm Large singing together. I'll be playing their music for the rest of the month. Oh what am I saying, just ask my friends. They'll tell you I play their music all the time. 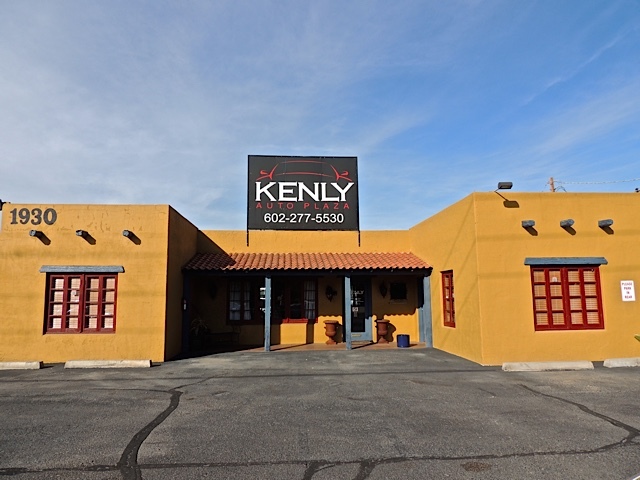 I pass by this place quite often and I've always admired the building which looks like an old hacienda style home but, in the past the front has been so obscured with cars that it wasn't worth trying to get a photo. Then the other day I passed it and not a car was in site. I hope that means they've sold them all and business is booming. :-) When I saw the coast was clear, I pulled in to get a photo. It certainly looks more like a home than a business establishment. Put in a nice desert landscaped yard and there you have it. I went on a bit of an adventure last Friday. 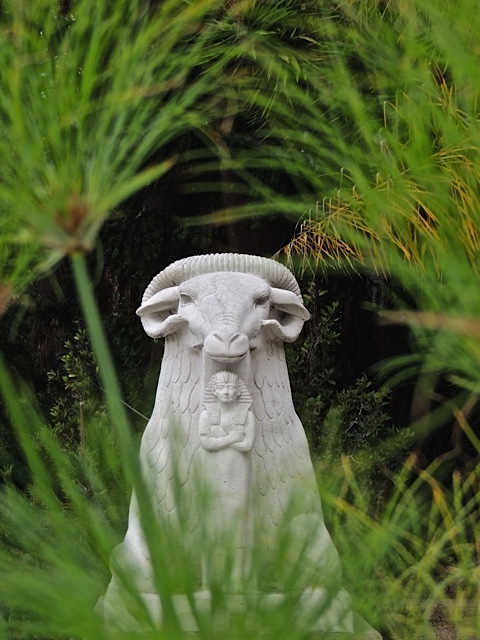 I flew to San Jose California just for the day, to visit the Rosicrucian Egyptian Museum. I had been there once before, probably about 20 years ago and I wanted to experience the place again. The museum and the grounds are built like ancient Egyptian buildings and gardens and the museum itself contains the largest collection of Egyptian artifacts on display in western North America. I've always been fascinated by ancient Egypt. When I planned the trip about a month or so ago, I was hoping for a bright sunny day for photographing the beautiful buildings and grounds but, nature had something else in mind. It was cloudy and rainy all day long but that didn't stop me from taking almost 300 photos that I now need to sort and edit. I enjoyed the day very much in spite of the weather and the long commute. It was a long day but, well worth the trip. I'll have some of the photos and more information about the museum in about a week or so on my Sharon's Sojourns site but, for today I'm visiting one of my favorite places in St. Louis. The sign to the left reads "Staff Only" and I guess since Mr. Roadrunner is technically part of the staff, it's okay for him to be behind the chain. 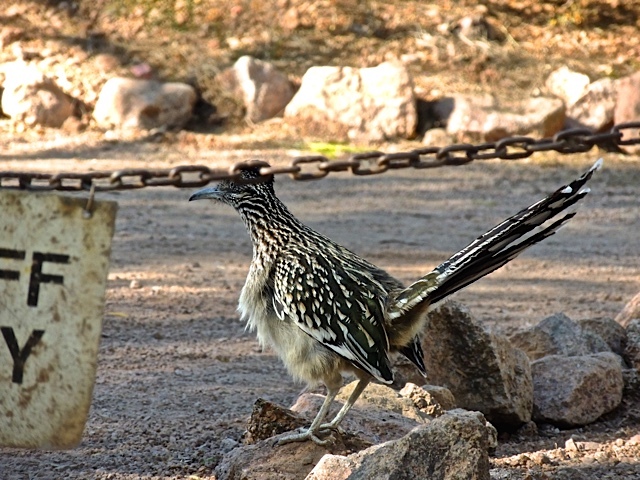 I saw this guy at the Desert Botanical Garden (where else) and he was heading for safer ground after being chased by an enthusiastic youngster. It rained all night Wednesday night and most of the day yesterday but by the afternoon the rain had stopped and the clouds started parting. 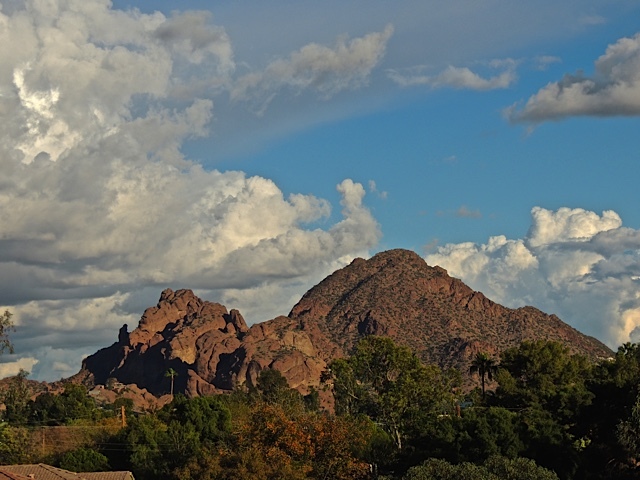 Those waves of clouds make for some nice effects over the top of Camelback Mountain. 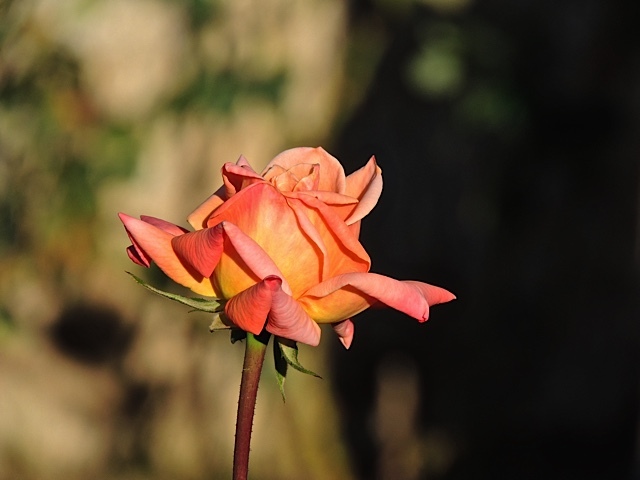 I saw this gorgeous rose blooming in someone's yard and it called to me to be photographed. It looked simply perfect in the late afternoon sun. I recently did some shopping at a mall that I rarely go to. The Paradise Valley Mall, although closer to me now than before I moved, is still quite a distance away but, the store I needed to visit was there so off I went. I don't think I had ever seen so many attractions for the kids at any other mall. 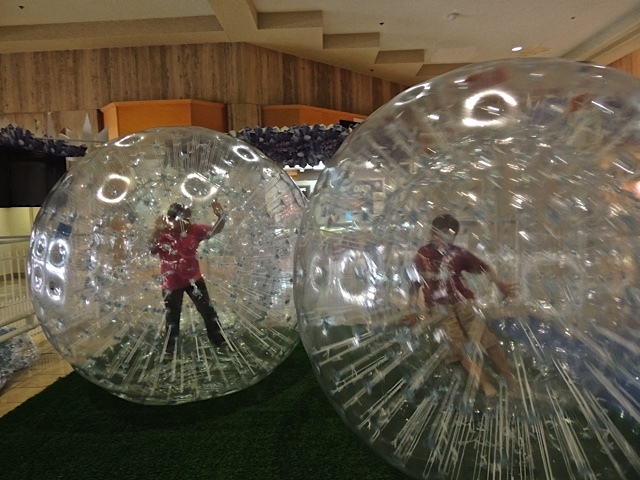 They had these giant balls for kids to get inside. 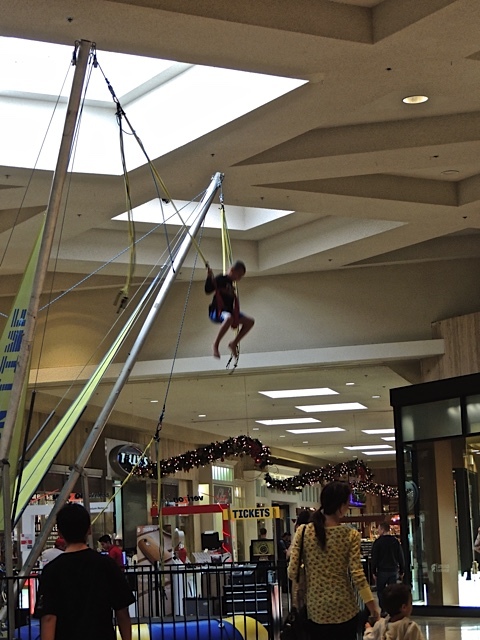 They had this bungee jumping contraption so kids could soar above the crowds. 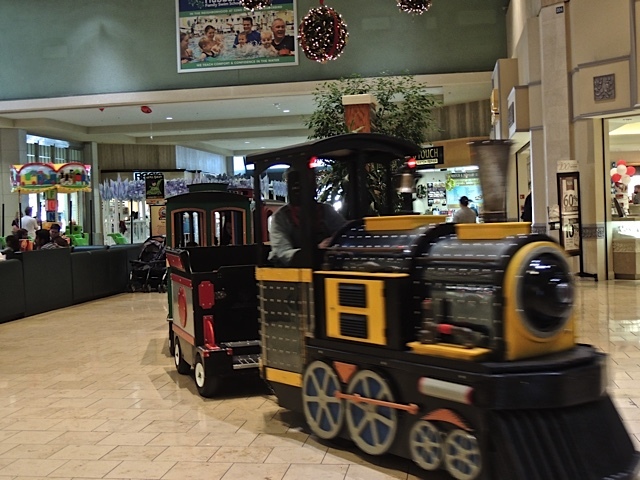 They had a train that the kids could ride from one end of the mall to the other. With a toot-toot and bell clang, it whizzed right by me. 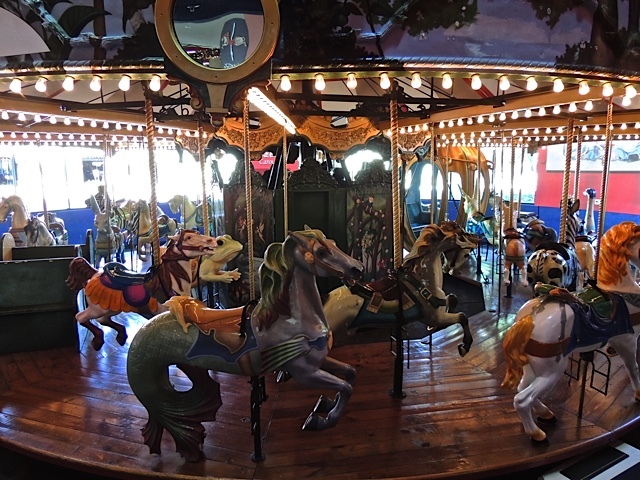 And, for the more classic children's entertainment, the mall had a full sized carousel located in the food court. I'd say there is plenty here to keep the kids busy while the parents shop. Sometimes the strangest things catch my eye. 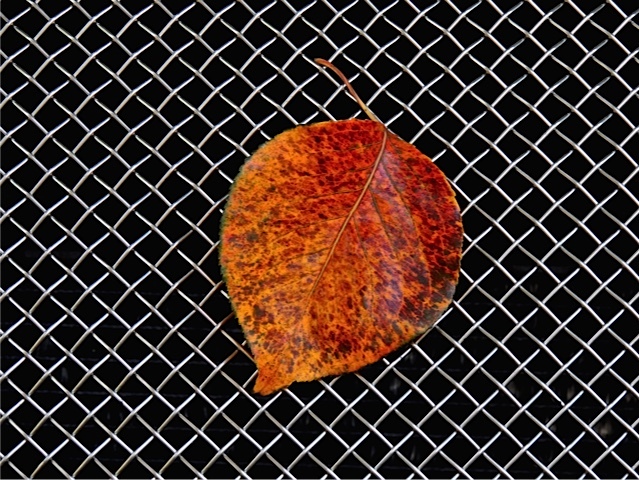 This last weekend I was walking toward my car when I spotted this single leaf clinging to the front of a car. The tree it came from is still full of bright green leaves but there seems to be just a few that have started to turn color and fall off. This one attached itself to the grill of this car. Any idea what kind of car it is? 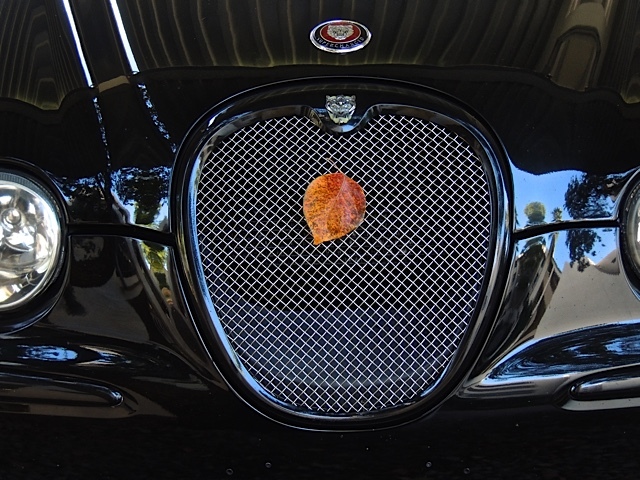 It was a nice shiny black Jaguar. I wonder if that leaf was as attracted to that car as much as I was and decided to hop on for a spin around town. When I went into the Queen Creek Olive Mill store at Biltmore Fashion Park on Saturday morning, I wasn't even thinking of photographing the workers there. I was more intent on purchasing my favorite olive oil. However, Dana Geary, the store Manager (on the left) told me they had been interviewed and filmed earlier that day for one of our local television stations because the day was designated "small business Saturday". I thought since they had been interviewed that morning that maybe they wouldn't mind posing for a photo. 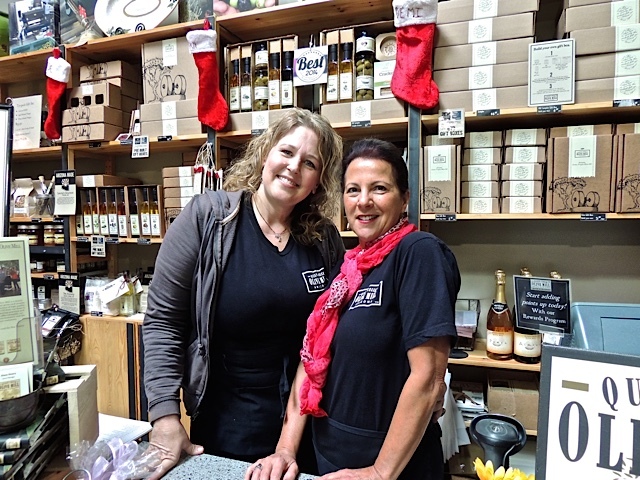 They didn't so, here we see Dana and Joan Trueman, two enthusiastic sellers of all things related to olives and vinegars. To top that off, when I explained what the photo was for, I found out that Dana actually follows my site and was pleased to meet me in person! It was fate! The December 1st theme for all City Daily Photo bloggers is "Workers" so, click the link to see other hard working people from other cities around the globe.